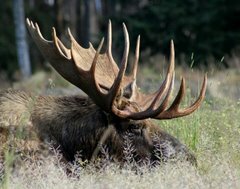 Moose Tracks: Who Will Watch the EPA? So the EPA -- the guys that classify the CO2 you breathe out as a "pollutant", tell you how much water constitutes a flush in your toilet, and if you get to use plastic bags at the grocery or not (to just name a very few of the myriad of things they "regulate"), made a MILLION GALLON toxic waste mistake! If they were a mining or oil company that ACTUALLY PRODUCES SOMETHING, what do you suppose the national media reaction would be?? The age old question of big government (and all "watcher" groups) is "Who will watch the watchers??" ... the watchers are not some super race, they are just plain old people, often less competitive people since they choose the safety of a government bureaucracy over the hurly burly of the private sector, but certainly "nothing special". Oh, possibly with the exception that they especially like having POWER over others based on POSITION rather than merit! The myriad of alphabet agencies (EPA, IRS, NSA, FBI, etc) are a classic example of bureaucratic obfuscation of responsibility. The agencies have no official "party" affiliation even though the people that work in them are 99% Democrat. The executive branch has direct day to day "control" over them -- but as we have seen with the IRS investigation of conservative groups, that supposed chain of command is nebulous at best. Congress supposedly controls the funding and has "oversight", but one needn't look very hard at the budgeting operations or attempts at said "oversight" in the case of the IRS to realize that this is also toothless. Giant incompetent hugely expensive bureaucracies running roughshod over productivity and individual freedoms without any real supervision. And some people wonder why America died.